The 2019 Houston Livestock Show and Rodeo starts this week. Considered our city’s “signature event”, it attracts over two million people every year. Artists like Tim McGraw, Cardi B and Lyle Lovett will share the stage with calf roping, bull riding and “livestock” competitions. 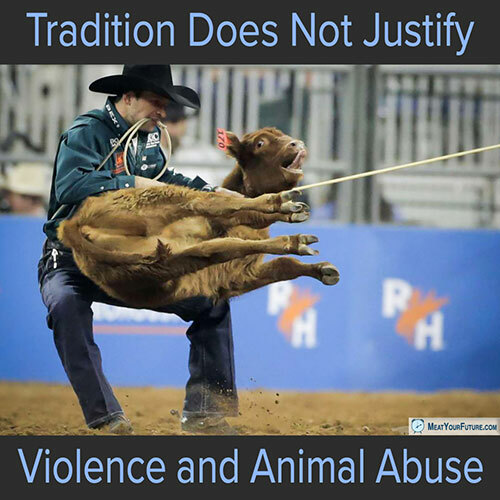 The rodeo’s continued popularity makes us wonder when, as a society, we will have the basic decency to stop treating animals as “objects” to use for our most trivial purposes. Instead of celebrating the absurd cruelty of this Western themed animal circus, can we not instead come together to respect and stop harming other animals for our trivial purposes? Please do not support rodeos, or any other completely unnecessary exploitation of animals – be it for entertainment, clothing, food, vivisection or otherwise. It’s the very least we owe them.